This dribbling soccer drill will help players recognize when to make runs and get comfortable making those runs with speed. Create two 20X20 yard grids about 12 yards apart. The other grid starts with four attackers and two defenders. The 5v2 grid will start the play. Players are instructed to make X number of passes (X depends on the age and skill level of the players). After x number of passes, players should choose a good opportunity to advance to the other grid on the dribble at match speed. Upon entering the new grid, the player should make a good passing decision to keep the game fluid and away from the defending players. Supporting players should open up the grid by getting wide and spreading out as much as possible. Make the right decision when to dribble across the grid. Make good decisions when entering the opposite grid. Make the correct decision to keep possession. Players in the opposite grid should get wide to give space and options to the advancing attacker. Restrict the number of touches per player while inside the grid. 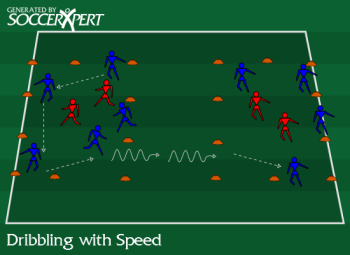 Allow one defender to track the dribbler and enter the opposing grid.